Now, after many spy shots and rumors, the 2012 Mercedes-Benz CLS has been officially revealed in all of its four-door coupe glory, at the 2010 Paris motor show, seven years after the CLS first graced the Mercedes range, but it enters a far more hostile market than the one it effectively invented in 2003. The CLS carved its own niche but its creation has since inspired the Volkswagen Passat CC, Audi A7 Sportback and BMW 5-series GT, while more practical saloons such as the Jaguar XF have aped its more sweeping, coupe-like window line. As you can see, the new model boasts a more aggressive design, but still in the arching lines that made its predecessor such a popular limousine. We can see more aggressive angles in the front, as well as the first full LED headlight assembly, with 71 individual LEDs composing the main headlight, running light, turn signals and side lamps. Mercedes has yet to reveal firm technical details, but expect a mixture of six- and eight-cylinder engines (with diesel to outsell petrol) and a range topped by a hot AMG version, boasting the tuning arm’s new 5.5-litre twin-turbo V8. It’s still likely to be badged the CLS63 AMG, though. Engines have yet to be detailed, but you can expect two gasoline versions to appear for the US market. 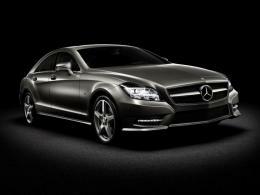 the CLS350 will most likely get a direct injection 3.5-liter V6, while the CLS550 will get a twin-turbo V8. We can see LED technology in the rear as well, while the side design borrows some cues from the already revealed 2011 CL Class. On the inside, the same attention to detail is present, as is a new three-spoke steering wheel with multiple controls. The new CLS also boasts the same gear selector as its other cousins, the S and CL Classes. The design retains its predecessor’s proportions yet manages to look strikingly different to before, a sharper, more chiseled appearance reminiscent of the Mercedes SLS AMG supercar and one which is set to influence a lot of future Mercs.